For the last 10 years, Scott Snyder has been a writer to watch at DC Comics, expanding the mythology of Gotham City’s underworld and changing Batman’s status quo in major ways. Now he’s writing Justice League—and upending the primal forces that flow through the entire DC Universe. I sat down with Snyder last week at San Diego Comic-Con after he’d revealed that another sinister version of the Dark Knight would be appearing in an upcoming Batman Who Laughs miniseries. However, aside from his Bat-centric stories, Snyder’s essentially become the showrunner of the new suite of Justice League books. The main title, Justice League Odyssey, and Justice League Dark all deal with fallout from the recent Dark Knights: Metal event, which unleashed a new sort of chaos throughout the universe. In the edited and condensed interview that follows, Snyder talks about transitioning from Gotham City to the Hall of Justice and the thematic underpinnings of this iteration of DC’s premier super-team. io9: You’re moving from Batman books, which have smaller casts and more intimate stakes, to a much bigger cast and cosmic-level stakes on Justice League. How are modulating your approach? Scott Snyder: I would give credit to everybody I work with. It’s an amazing team, but, it’s an incredible honor and I take it very seriously and sometimes the responsibility can be paralyzingly intimidating. But, for me, graduating from Batman to Metal, the idea was he had one big story we wanted to tell cosmically, and each would be modular. Each book would feel singular, but at the same time, it really is one big, rolling narrative. Metal, for us, really opened up the door for No Justice and then Justice League. So, what we have planned over the next year and a half, it really sort of branches out in spring and summer and just blows out. I couldn’t be more excited about it. A year from now you’ll see everything we have planned, but, ultimately, in terms of moving from a single book to Justice League, at first it’s really intimidating. But, you know, this is the book I’ve always wanted to write. Batman will always be my favorite character. but Justice League, since I was a kid, was always the heart and soul of the DCU—Superfriends, the animated series, Dwayne McDuffie, all of that. To me, it always felt like this is the heart of the DC universe, and each iteration of it was the kind needed for that moment. When Grant [Morrison] took it over and made the characters larger than life, because there hadn’t been a JLA, and put them on the moon and gave them that grandeur and majesty, I feel was perfect for that moment. For me, right now, what I’m trying to do with the book is make it connective and inclusive, which is why we chose the Hall of Justice, why we chose the Legion of Doom. I wanted it to feel as though it encompasses the DC world. Reflects the stories happening in the DCU, celebrates them, and also drives a lot of them, as well. That’s why we wanted you to feel coming in as a reader, they don’t live on the moon. They’re not these distant, dark characters, they’re here with us. You can go to the Hall of Justice and see the trophy room. You know? Martian Manhunter might be there in disguise sitting next to you at the lunch table. And in that way, these characters are in it with us. The way that the story starts—with the Source Wall breaking, the heart of the multiverse falling to Earth, and the heroes deciding what they need to do—the spirit of the book is supposed to reflect this moment in time where I feel like it’s much more likely we’re going to go into entrenched foxholes and subjective experience about stuff. What we’re really saying with the book is that these heroes need to come together to fix this problem if we’re ever going to fix this sinking life raft of a universe, because pretty soon planets are going to start flying out of the hole in the cosmos. It’s going to be crazy. And on the other hand, you have the Legion of Doom and you have Lex Luthor, who’s like, “The last 2000 years of civilization were all a derailment. By nature, we are dark, selfish, predatory, we’re meant to be subjective. We’re meant to only care about us and our tribe.” And so, he’s like, the universe—what that heart of the universe is, it’s the way to correct everything and launch us towards doom. So to me, it’s really about what these heroes stand for in a moment when, they are just fictional characters, but have tremendous folkloric potential for me. Justice is something I would argue is a system of ideals that we impose on the world when we’re not really there. Martian Manhunter says this a little bit in the first issue. It’s us reaching higher than the natural order. So, the natural world doesn’t reward right and punish wrong… but we want it to. And we reach to be better than our own biology. That’s justice. 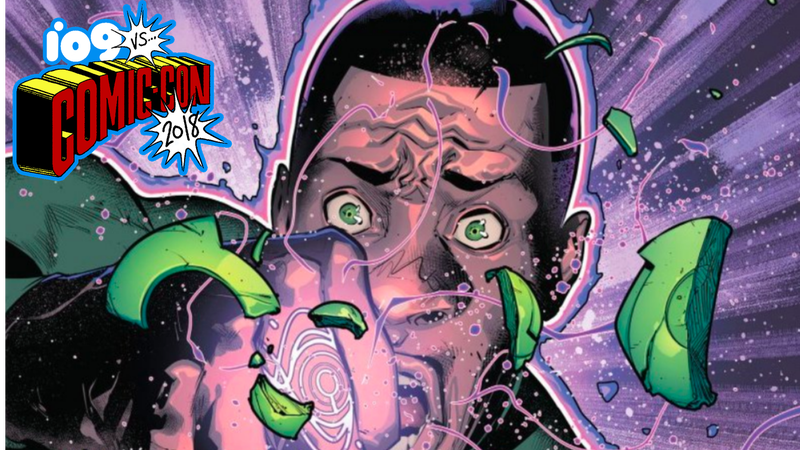 Superman and the Martian Manhunter explore the mystery of the Totality in Justice League #3. Luthor says “doom,” in its original linguistic iteration, meant “fate.” It had nothing menacing about it. And he says, “Embrace our own nature, embrace what we’re supposed to be, and embrace your own inner villain and be your best self.” So it really is the story—for me—of this moment in time, and yet, it sort of raises all this cosmic lunacy and bombast and giant Kirby-esque mythology, so, I’m very excited about it. It really is, for me, an opus. It sounds hokey to say, but...I tried to write each arc like “what if I never wrote another superhero comic?” I want to leave everything on the table and make sure we really made a story that brought everything in that made you feel that this is everything DC stands for. io9: You wrote Bruce for many years, and he’s a character who didn’t crack jokes, really. And now you’re writing him as comic relief with the Injustice League. Talk about reconciling those two usages. Snyder: Well, I tried to write him with humor in Batman, a lot of the time. One of my favorite lines is where he comes back [during the “Superheavy” arc] and is like, “Who died and made you Batman?” to Gordon. When you’re dealing with him singularly, he’s such a pathological character, he exists at this intersection of heroism and pathology that’s so endlessly interesting. It’s self-destructive and yet hugely inspiring. So, when you have a team, I can play him for comic relief. Even in the next issue, he literally fights Lex Luthor in Superman’s brain! He brings a Kryptonite ring, and he has some of the best one-liners I’ve written: Luthor’s like, “You know the difference between you and me?” and he’s like, “I have teeth.” But there’s a joy to this book and—not a light-heartedness because it’s dark—a craziness that comes off of Metal that has more grandeur, more majesty. And also, I get to play with my Dark Bruce, because we’re doing Batman Who Laughs. And that’s going to be like the darkest Batman story I’ve ever done. The book I’m doing with [Greg] Capullo—Batman 25 years in the future—is quite dark as well. In Justice League, I get to do Batman—not light—but at least I get to play him for comic relief because those books were really probing and dark and exploratory about some of the real nightmarish aspects of the mythology and his character. io9: You’re writing J’onn J’Onzz and he’s the chairman of the Justice League, its anchor. But in the first issue of Superman by Brian Michael Bendis, he’s basically telling Clark, “Hey, you ever thought about taking over the world?” Will that conversation tie into Justice League at all? The Martian Manhunter argues that Kal-El should open himself up to a position of global leadership in Superman #1. Snyder: Brian and I talk quite often. For family reasons, I was friendly with him, independently, just on a personal level, before he came over. We had a couple connections that brought us into contact. Once he came over, there’s no barrier between us, there’s no hesitation over getting on the phone over even the smallest stuff. We’re trying very hard to make sure you feel it’s a united universe. So, you’ll see stuff happen in Superman very soon that’s reflected in Justice League and vice-versa. You’ll see the Hall of Justice in Superman and what [Bendis] is doing with Jonathan and Lois, all that stuff gets reflected. For us, this is the best time that I’ve been at DC. The bench of writers, we enjoy each other’s company, Tom [King] is one of my closest friends. Josh Williamson, James Tynion, Bryan Hill now… we were all friendly outside of comics. And now that we get to work together, there really is a level of connectivity that wasn’t there, I think, three, four years ago. io9: Talk to me about your favorite Justice League stories. The touchstones for me aren’t even stories, I loved the way the animated series envisioned the entire mythos in a particular way, and the way Grant did that, too. And Geoff did that as well. I think there were different demands in the New 52 that sort of made it need to be more siloed, which was a difficulty. But overall, what I love is when someone comes on with a very distinct vision for what the book needs to be. And for better or worse, I’m certainly trying to do that. When you pick it up, I want you to feel it’s fun, insane, stuffed to the brim with ideas and stories and mysteries and all that but it’s also deeply emotional and personal. io9: Why do Superman, Batman, and Wonder Woman need the League? Snyder: For me, it’s the relationships between them, beyond what each one stands for in a power set. They are each other’s emotional support system. And when you’re Superman and you don’t know what to do, Batman is there. It’s those relationships and that family, honestly, that makes these stories so fun to write. We’re doing something with the Totality, which is the heart of the universe that falls to Earth. There are seven forces that govern the universe and they’re positive, progressive forces—the Speed Force, the Emotional Spectrum, etc. Luthor discovers there are antithetical forces that are coming out of the Source Wall rupture [note: this originally said “Speed Force rupture”; apologies for the error.] The Justice League stands for those positive forces and the values they stand for, which makes them each larger than life, in that regard. But ultimately Superman, Batman, and Wonder Woman need the League because they need each other. The threats are going to be so big that if they don’t band together—it really is like the universe is a sinking life raft—it’s going to sink very fast.